AMD released its AGESA 1.0.0.6 update to Ryzen motherboard partners back in May and it resulted in a new wave of BIOS updates. AGESA 1.0.0.6 had a particular focus on new options for tweaking and overclocking memory. However, sometimes users faced with too many options are overwhelmed - it can almost be as bad as having too few options. 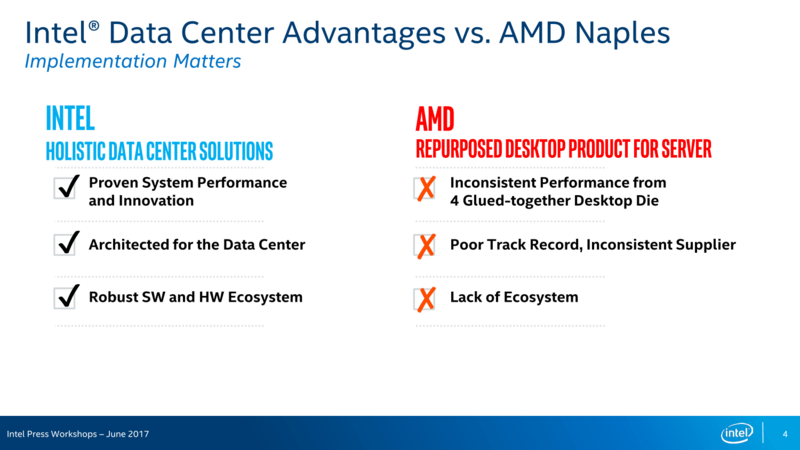 Addressing this very issue AMD technical marketing exec Robert Hallock has put together a new blog post with the help of resident OC guru Sami Makinen. In the order of the bullet point list above, we first consider Geardown mode. This is a mode which allows greater memory compatibility but can sacrifice performance. However as seen in the graphs of AMD testing (in Tomb Raider, Hitman & 3DMark Sky Diver) turning GDM off only improves performance by between one and three percent. BankGroupSwap (BGS) is a new option that "alters how applications get assigned to physical locations within the memory modules". As a general rule games are a little faster with BGS off but benchmark progs do better with it on. A PC talks to the memory chips on the DIMM stick in ranks. Some DIMMs have all the memory chips in one group and are called single rank DIMMs. 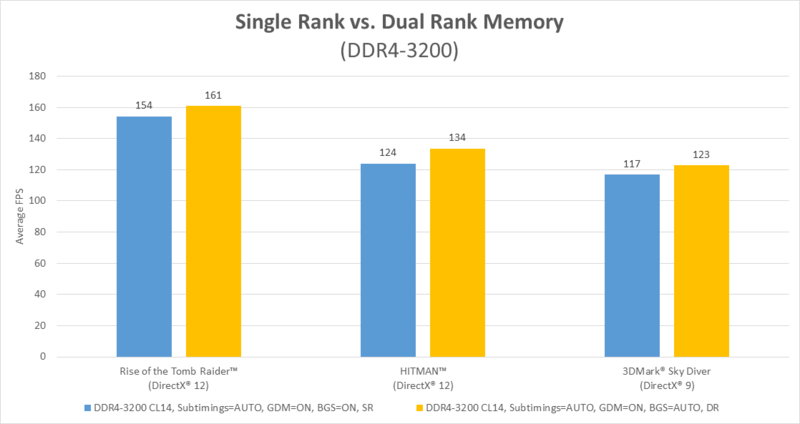 Dual rank DIMMs obviously use two groups, and can be harder to drive at higher frequencies. 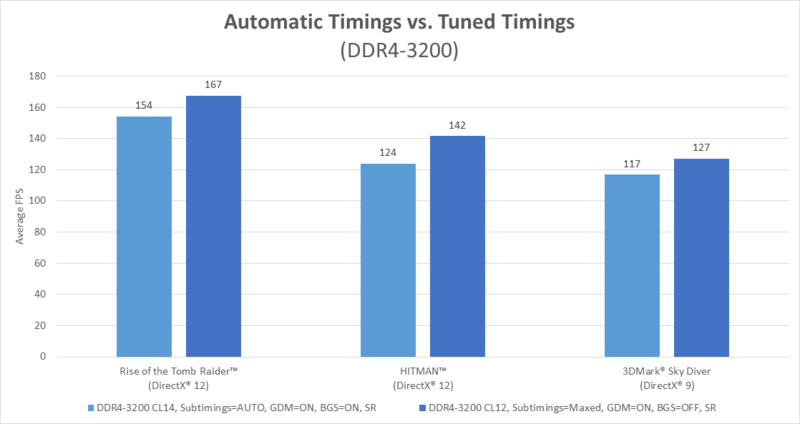 However thanks to bank interleaving the second memory rank in DR DIMMs can still perform work while the first is being refreshed for use and thus they can deliver a small performance benefit in games, at the same clock speeds (see above). However, with an expert overclocker yielding SR DIMMs the tables can easily turn. On the PC that AMD's overclocker tested, tuned timings garnered significantly better performance than those auto-selected by the BIOS. It's a tricky craft to balance all your settings for performance, compatibility, and stability but at least this shows you the results may well be worth dabbling with these settings when you set up your Ryzen system. Check out the graph below, to see Makinen's tuned timings compared with auto timings in Tomb Raider, Hitman & 3DMark Sky Diver. tWCL = 9, tRFC = 224, tRTP = 8, tRDRDSCL = 2, tWRWRSCL = 2, ProcODT = 60Ω. 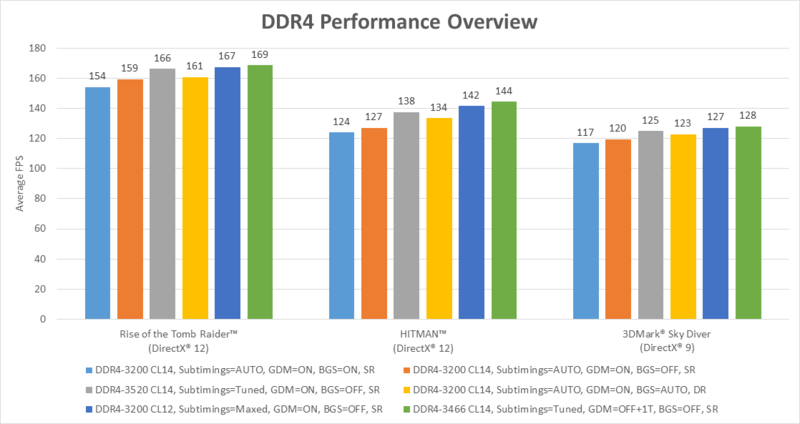 Lastly, working through the settings bullet point list the overclocker tested whether aggressive DDR4 timings or frequencies delivered the best results for users. In a nutshell - tighter timings won. "DDR4-3200 with aggressive timing adjustments outperformed the looser timings needed to hit DDR4-3520, while 3466 clearly split the difference with the right balance of timings and frequency," explained AMD's tech marketing expert. Armed with all the above testing info and settings delivered a number of key insights for AGESA 1.0.0.6 updated motherboard users. If you haven't already come to your own conclusions from the above, AMD made it clear that while DR DIMMs are best for set and forget via XMP profiles, an experienced overclocker can get SR DIMMs to outperform them. Additionally gamers are probably best with BGS off and GDM disabled. Lastly , if you can, hand tune your memory timings as it will deliver greater performance gains than the simple chasing of the highest possible clock speeds. AMD welcomes comments on its community advice, and it would be interesting to read AGESA 1.0.0.6 update experiences from HEXUS readers too. Presumably that Intel are seriously scared of Naples given that for petty much the first time ever they have named a competitor. It isn't even right as Ryzen is clearly a server processor re purposed fr the desktop, hence the large core counts, low clocks, and great power efficiency. Ah, so you referenced the Intel Slide as a joke at Intel because AMD is developing a strong ecosystem? Might be worth expanding on your jokes in the future as it just looked like you were slating AMD (if that isn't the case).